WARSAW — It started with a bang. Literally. 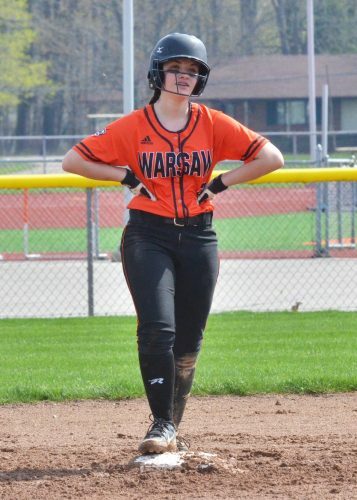 Saturday’s scoring barrage from the Warsaw softball team got going after Abby Glass clanked a home run off the center field scoreboard against South Bend Washington. It was all a blur from that point forward as the Tigers dismantled the Panthers 16-3 in five innings. Glass’s first inning homer was the first of five RBIs in the game. It was also the first of two home runs in the opening frame. Saylor Bradley made the Panthers pay for a two-out walk of Jordan McClone by hitting another ball over the centerfield fence. This one did not have a satisfying clank against the scoreboard like Glass’ shot, but it was just as pleasing to the home crowd. The Tigers built on their 3-0 lead in the second inning, starting with a an RBI from Carmen Albertson. Later, with two outs on the board, Glass came up and knocked in her second and third runs of the game to make it 6-0. McClone followed suit by brining home Glass, McCLone was then hit home, again, by Bradley. The Tigers led 8-0 after two. Washington’s coach Richard H. Burton could be heard telling his team between innings, “We aren’t even competing.” The Panther responded to their coach on offense in the third as Amani Lee cleared the fence for a three-run homer, bringing home Jasmine Harris and Daylynn Hamilton in the process. That put some life back into the Washington dugout, but the joy was short-lived. Warsaw added four more runs in the bottom of the third. Izzy Dittmar had a nice milestone moment as she started the scoring in the frame with her first career hit, a two-out double, scoring Albertson and Adara Frey. Dittmar then scored on an error. Glass represented the final run of the inning as she was knocked home by Bradley, giving Warsaw a 12-3 advantage. Frey scored again in the bottom of the fourth, thanks to a wild pitch. That was the first of four more runs from the Tigers. Glass doubled in the fourth, which scored Dittmar and Morgan Ashtari. Glass then scored on a single from Katie Anderson to cap the thrashing of the South Bend school. All of the runs in the fourth inning came with two outs on the board. 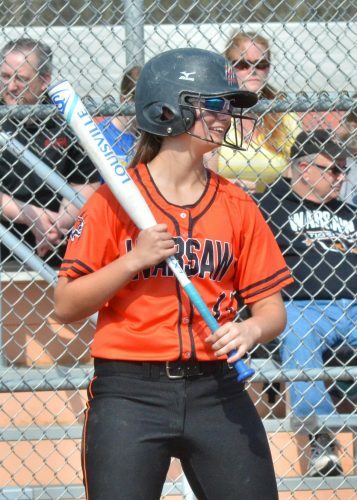 In fact, two-out hitting was huge for Warsaw on Saturday as they it scored 15 of its 16 runs with just an out to spare. Glass was surely the most notable players in the game as she was 3-3 with a walk, five RBIs and four runs scored but she was far from the only Tiger with an impressive state line. Bradley was 3-4 with a run scored and four RBIs, McClone finished 2-3 with an RBIs, two runs scored and a walk. Dittmar ended up having two hits on the day and three runs scored while Frey had three runs of her own. 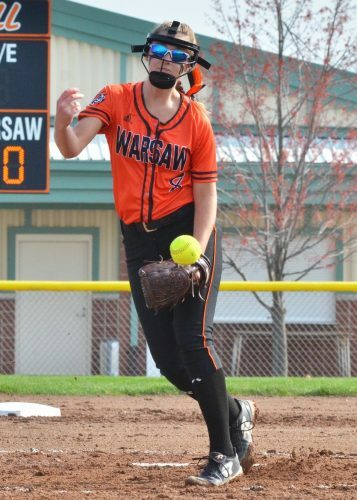 Courtney Chookie picked up the win for Warsaw with four innings of work. The sophomore fanned six Washington batters and walked just one. Glass pitched the final inning for the Tigers, recording a strikeout in the process. Warsaw (2-2) hosts Wawasee on Monday at 5 p.m.. Washington (1-6) will host Bremen Monday evening. Courtney Chookie picked up the win in Saturday’s contest. 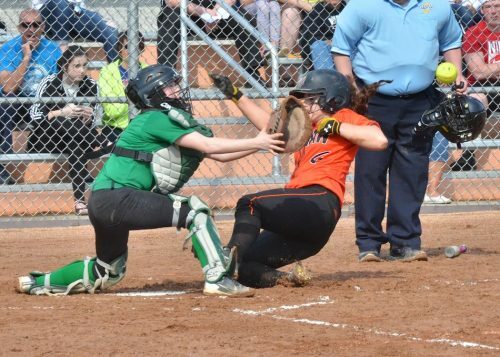 Adara Frey beats the ball and the tag, sliding safely into home. 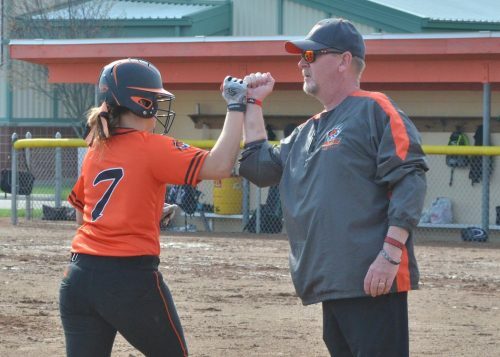 Abby Glass rounds third and gets congratulated by her coach, Kevin Dishman after hitting a home run in Saturday’s game.